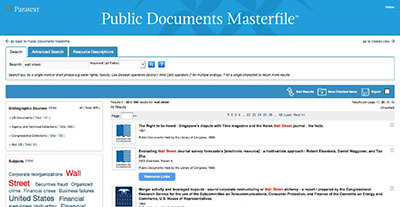 The best search tool for government documents discovery has undergone a transformation.Public Documents Masterfile has a look and feel that’s brand new and enhanced search features to go with it. We’ve kept the basics that make Public Documents Masterfile so valuable to government documents librarians. You can still search for current and historical primary sources, government documents printed by the GPO and beyond, and for a great variety of research information produced by well respected sources. What we’ve changed is how intuitive it is to all users, the appearance of the resource and the type and variety of faceting options. A more intuitive design that offers faster results with less clicks. A hyperlinked subject tag cloud that gives researchers ideas for related searches to view. Detailed resource descriptions to give users a better understanding of the context of their results. relevant blog posts on content updates to Public Documents Masterfile. informative blog posts on interesting subjects researched using Public Documents Masterfile. If you’d like to give the new Public Documents Masterfile a try, contact us for a free 30-day trial today.